Download or read online the States Can analysis of the implications for states and territories of banning new coal and fossil gas projects under No More Bad Investments (NMBI) legislation. Feedback welcome! As future revisions are made, the above file will be replaced with the latest version. 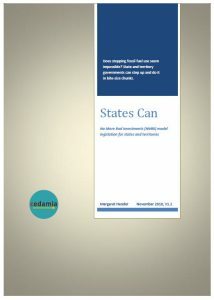 Download the States Can Summary. 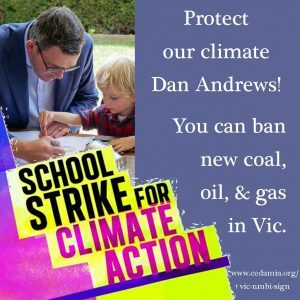 There is a disconnect between what ‘everyone agrees’ we need to do in response to the climate emergency – stop using fossil fuels – and their response when anyone seriously proposes any fossil fuel bans. ‘Oh we can’t do that!’ they say, perhaps thinking that the lights will go out or the economy will collapse. The October 2018 IPCC Special Report urges very rapid reductions in the use of coal and fossil gas, and in November 2018 even the Director of the International Energy Agency said, ‘We have no room to build anything that emits CO2 emissions’. 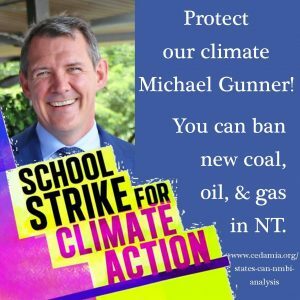 Under No More Bad Investments (NMBI) legislation, state and territory governments can take the first and easiest step by banning NEW climate-damaging projects in their own jurisdiction. They could get rid of coal and fossil gas one chunk at a time and achieve what the federal government seems reluctant to tackle. 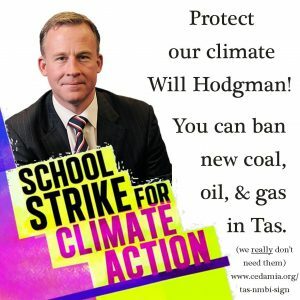 All Australian states and territories could immediately ban at least some types of new coal and fossil gas activities, and some could adopt all the bans discussed in States Can, without the lights going out and with very little adverse economic impact. All states and territories could immediately ban new fossil fuel exploration. They could limit new coal and gas export contracts by banning any new export-oriented coal and gas extraction and infrastructure projects. It would be particularly beneficial from a climate perspective to stop all new LNG export contracts. The quantity of emissions caused just by LNG processing itself is so high that it more than cancels out the climate benefit of our emissions reduction progress in the electricity sector. 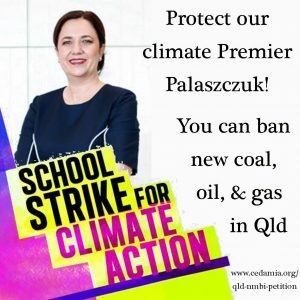 Existing export contracts might make it difficult for Queensland and NSW to ban all new coal mines and gas wells, but they could allow only those necessary to meet domestic demand and current export contracts. All other states and territories could ban new fossil fuel extraction projects without risking supply shortages. All jurisdictions could ban new coal-fired power generation without any risk of the lights going out. Most if not all could also ban new fossil gas-fired electricity generation as long as they allow sufficiently rapid expansion of renewable electricity generation, storage, and interconnector capacity. If new fossil fuel extraction and infrastructure are banned, market certainty would make a rapid transition almost inevitable. 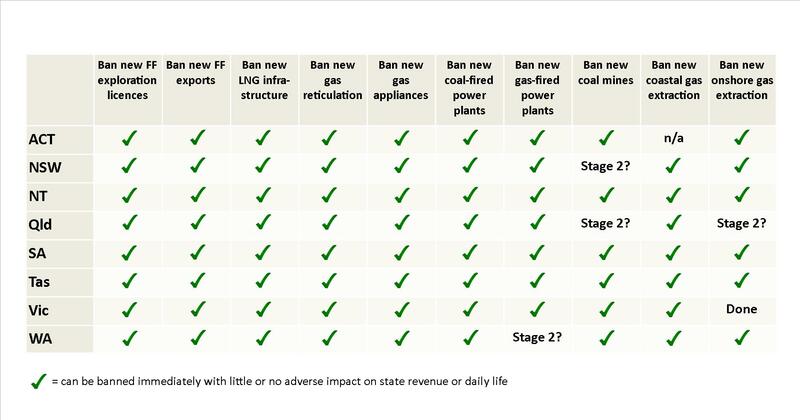 In the short term it might be necessary to continue to allow new industrial facilities that use coal or fossil gas in some supply chains, but bans could apply to new facilities immediately in cases where climate-safe alternatives already exist. These days all-electric households with modern efficient appliances have fewer greenhouse gas emissions and lower energy costs than dual-fuel (gas plus electric) homes even without solar PV, and particularly so if they have solar. 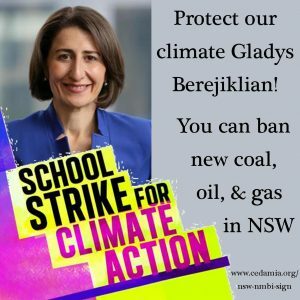 All jurisdictions could immediately ban new fossil gas reticulation and the sale of new gas heating and hot water appliances. The economic impact of banning new coal and fossil gas extraction would be minimal. Any reduction in jobs would be more than met by an increase in renewable energy jobs. The state revenue from coal and gas royalties is surprisingly small, and subsidies reduce that benefit even further. Coal and fossil gas export profits primarily benefit the mostly foreign-owned export companies and their shareholders rather than the Australian economy. In 2015-16 there were 39 fossil fuel companies who paid no income tax. Between them they had an income of $71.9 billion. Woodside is the only LNG export company that has paid any Petroleum Resource Rent Tax (PRRT) so far. The public might look to the federal government for action on the climate emergency, but sub-national governments have the power to make many of the necessary changes in their own jurisdictions. 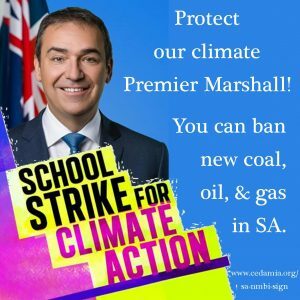 One by one, all states and territories could enact fossil fuel bans until a patchwork of bans covers all of Australia. 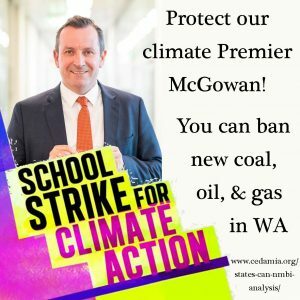 Which state will be the first to step up as a climate hero, brave the ire of the fossil fuel industry, and ban NEW and avoidable fossil fuel projects explicitly on climate grounds? Click the images below to view the GIFs and share them on Facebook.